Baseball practice, cheerleading, carpool, to the mall, chicken soup….give back to Mom for all that she does. This compilation of your choice of a wine or champagne is brought together with the relaxing scents of lavender and pomegranate and passionfruit. 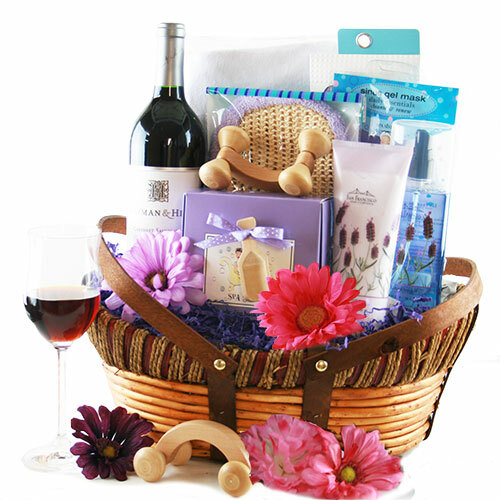 From a terry cloth bath pillow and eye gel mask to soothing lavender bath salts and moisturizing body lotion this Mother’s Day wine basket is sure to score serious brownie points. California, Colorado, Florida, Missouri, North Carolina, North Dakota, Nebraska, New Jersey, New Mexico, Ohio, Texas, Washington, West Virginia, Wyoming, and District of Columbia.